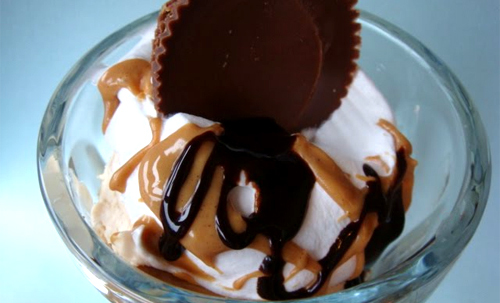 It’s surprising how far sharing a peanut butter cup sundae with great people will go toward improving your day. All right – maybe it’s not all that surprising. But I’d still like to tell you about it (you can just act surprised). Last night, I was sitting in a restaurant, treating myself to a wonderful dinner of panko haddock with summer veggies in white wine garlic sauce over linguini. Incidentally – it’s surprising how far treating yourself to a wonderful dinner of panko haddock with summer veggies in white wine garlic sauce over linguini will go toward improving your day. Well, as I pondered how just how improved my day had been over a bite of perfectly-cooked asparagus, I got a whim. What would happen if I did the unpardonable and *gasp* had ice cream right after having had pasta for dinner? Shameless, I know. I called a couple of high school guys that I hang out with and asked if they wanted to get that ice cream with me. They were all too happy to oblige. I picked them up at exactly ten o’clock PM and we arrived at the ice cream place by ten-fifteen. We were met with the most jovial greeting I can recall at a restaurant – and it was 100% sincere. Heather, who was wearing many hats at this late hour, reminded me more of Mrs. Claus or a Swiss baker in a children’s movie (minus the Pippi Longstocking braids). She was a treat all by herself. After some serious consideration over what to get – followed by some more serious consideration after finding that our first choices were all unavailable – what wound up being placed in front of us were three peanut butter cup sundaes. The boys both got extra peanut butter cups. One got extra cups, extra chocolate sauce, extra peanut butter sauce – the works. I demurred somewhat, exchanging the sauces for banana wheels instead. As a matter of fact, I did have the song. I had the whole album. And I had it for the sole reason that this boy had previously confessed to me, head to head in hushed tones, that he and his best friend (the other kid in our trio that night) had dubbed it “their summer song” as a kind of private joke between them. So, in anticipation of the right moment, I had it all loaded up and waiting, and was all too happy to oblige. In the car, we rolled the windows down and cranked the song as we drove – with extra bass boost at their request. They sang out the lyrics, ostentatiously off-pitch as the song thumped along, waving their hands rhythmically in the wind. Now, the song is by Selena Gomez, a young female artist in the dance-pop genre. Strike one against your average teen boy. Said artist is currently dating Justin Bieber. Strike two. They were actually singing it together. Loudly. (I added some harmonies on the parts I knew.) Strike three. And none of us could have cared less. We weren’t thinking about what we should or shouldn’t like or do. We just did what felt happy to do in that moment. I smiled so big it hurt. When the track ended, they asked if we could listen to one more track on the album: “Who Says (You’re Not Beautiful).” Realizing that we were almost to their house, they asked if we could just drive around a little longer while they listened and sang. Being with good people. Free. Singing at the top of your lungs and being silly. Free. Sharing your love and appreciation for friends. Free (discounting for text rates, if you choose that mode). Listening to your favorite song. Unlimited free use after 99-cent purchase. Driving with the windows down and your hands waving in the wind. Less than 75 cents in gas. The “big ticket item” was three peanut butter cup sundaes with extra-extra toppings, which still came in at under twenty bucks. It all got me to thinking, once again, that money really isn’t the key to happiness. This brought me right back to that night. i couldn’t have said(or wrote) it any better. Thanks so much Erik! Thank YOU for making that night what it was. It could not have happened as it did without you, which is a pretty darned cool thought.